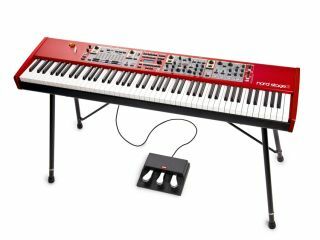 NAMM 2011 PRESS RELEASE: Nord Keyboards are proud to announce our new flagship instrument line: the Nord Stage 2 Series. The Stage 2's Organ section features 3rd generation organ modelling derived from the C2 Organ together with advanced rotary speaker functionality. The Stage 2 has an all-new synthesiser section with the genes of the Nord Wave. Additional tone-generating options, a powerful arpeggiator and, critically, compatibility with the Nord Sample Library. The Stage 2 now has access to the existing library and thanks to the included Nord Sample Manager software users can create their own sample-based programs. In addition, the Stage 2 88- and 76-note versions feature a superb new custom-designed keybed to further increase the instrument's playability. Additional new features include MIDI over USB functionality, monitor input, midi sync. for the global master clock and master clock sync. for LFO, arpeggiator and delay. Prices are to be confirmed but are likely to see an increase over outgoing Stage EX models.